I’m going to post my first In My Mailbox blog entry. This blog meme is hosted by The Story Siren. 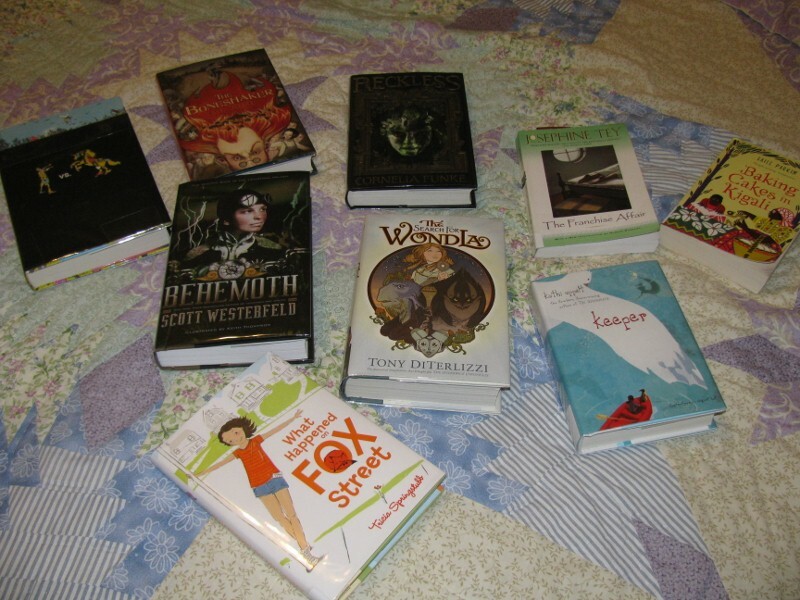 Now, I don’t get a lot of review copies in the mail, but I do check out an awful lot of books from the library. Now, mind you, I don’t always get them read as fast as I want to — So many books, so little time — You know the story. I thought this would be a fun way to mention the books I’m excited about reading — and hope that some day I’ll be able to follow up and give you a review. First, last weekend at the Horn Book at Simmons Colloquium, I got three books signed by their authors! 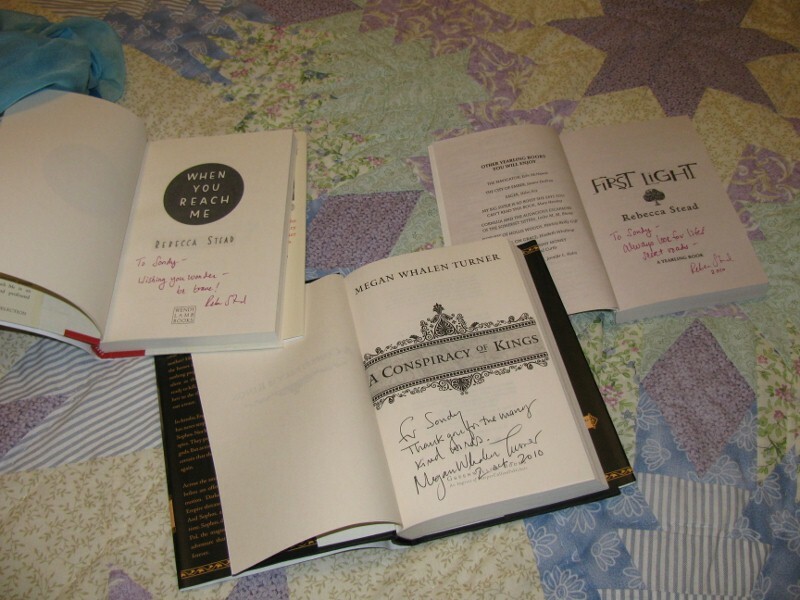 A Conspiracy of Kings, by Megan Whalen Turner, When You Reach Me, by Rebecca Stead, and First Light, by Rebecca Stead. I’ve already read and loved the first two of those, but now want to read Rebecca Stead’s first book, First Light. Next, I really did get some books in my mailbox the past week or so. Enchanted Ivy came from author Sarah Beth Durst, because I loved her earlier book, and the same with Penny Dreadful, by Laurel Snyder. It’s so exciting to get books in the mail that I’m quite sure I will like! 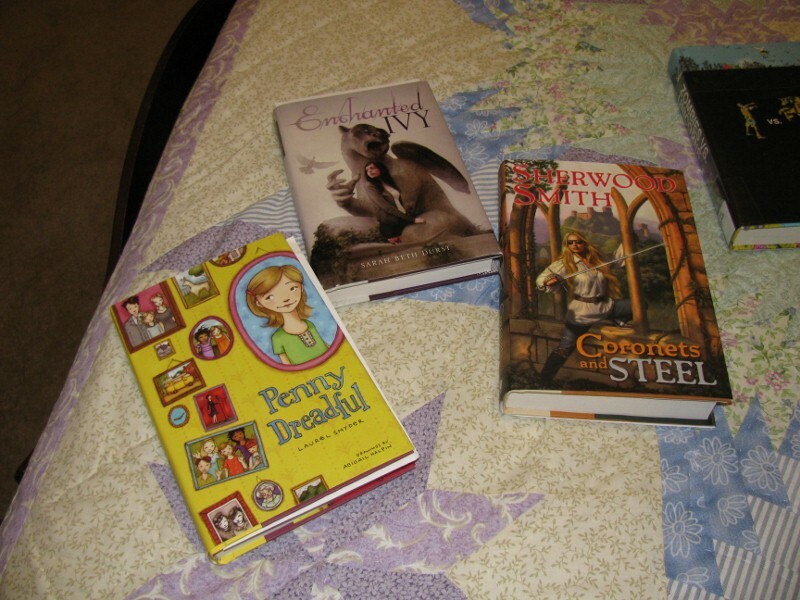 The other book came in an Amazon order because it’s a new Sherwood Smith book I don’t have, Coronets and Steel. I want to try to read it before October 15th, because I have a feeling I will want to nominate it for a Cybils Award, and I’m not sure it has already been nominated. 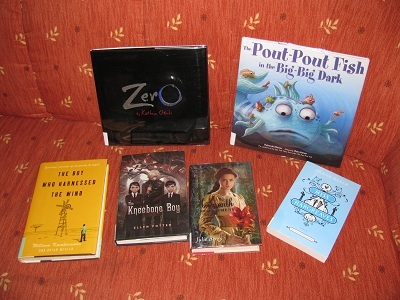 Finally, there are Library books I’ve checked out in the last week or so — or some of them. Now, I ALWAYS overdo it on checking out library books. Plenty of these I will not get to before they are due, and if they have holds, now that I’m not working for the library with that mighty “override” power (that I try not to use, honest! ), I will have to turn them back in, unread. 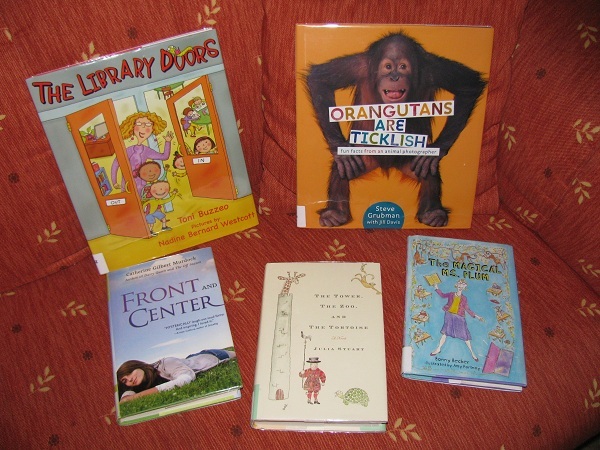 However, I pictured the books that I checked out recently that I really really want to read. Zombies vs. Unicorns, edited by Holly Black and Justine Larbalestier. This book contains stories written by many outstanding authors, including Diana Peterfreund, who wrote Rampant and Ascendant. She told me about this collection a year ago at the Kidlitosphere conference, and I’ve been eager to read it ever since. Go Team Unicorn! Behemoth, by Scott Westerfeld. This is the sequel to Leviathan, so I’m very eager to read it. A little disappointed the library doesn’t have the audiobook form yet, though. 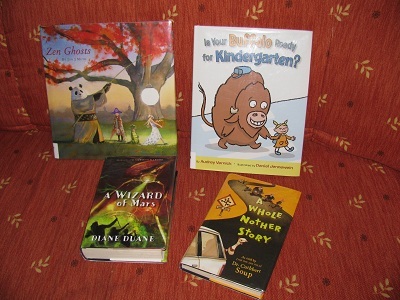 What Happened on Fox Street,, The Boneshaker, Reckless, Keeper, and The Search for WondLa are all books I’ve heard good things about on kidlit blogs. Two adult books in the pile are Baking Cakes in Kigali, which has a really cool title, and The Franchise Affair. I am on a Josephine Tey kick lately, after having listened to her classic The Daughter of Time and two of her other books. She wrote mystery novels during the Golden Age of detective fiction, a contemporary of Agatha Christie. I haven’t yet posted my reviews of her books, but I am definitely hooked. Obviously, I will NOT get even close to reading all these books in a week. Will posting what books I check out each week help me to control myself and limit myself to the number of books I can actually read? I doubt it very much, but there is something satisfying about telling people about all these great books I can read if I can just find the time! You are currently browsing the archives for the In My Mailbox category.